Art and Myrtle are back in this third book of the Larklight series. It's the Christmas holiday and the Mumby family is just about to relax and enjoy their Christmas dinner when visitors arrive with a very strange photo and word of a distress signal from the planet Georgium Sidus (only improper people call it Uranus!). So, off they go on another rip-roaring Victorian space travel adventure! And, as usual, the fate of the universe hangs in the balance. I've quite enjoyed all three of the Larklight books, although I must confess that I've found each one of them a little bit longer than would be ideal. They're action-packed and funny in an extremely well-crafted alternate world. ...that the books are children's fantasy stories with protagonists that are not orphans. Mr. Reeve has crafted many believable and creative ways for the kids to take over the action without killing off the parents. Writers take note: this is how it's done! Highly recommended for fans of fantasy-adventure. *I did start The Comet's Curse and read 66 pages before putting it down. It just wasn't keeping my interest enough for this late in the game. I think it's due back at the library, but I may pick it up at some point in the future. Has anyone read it that wants to weigh in? 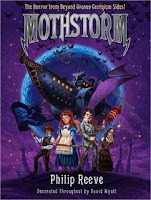 Yea for Mothstorm!! I do agree that they are a bit on the long side, but I still love them. I read Larklight, and found it underwhelming, but I have to admit that I was made curious about your non-orphan comment. For a writer to be able to do that is quite interesting. I think I liked STARCROSS and MOTHSTORM more than Larklight, if only because the world was already built and I felt like I got the "rules" and everything, so it could get straight to the action.